I have been anxious to read this book from the second I finished The False Prince. After the amazing story told in the first novel, I couldn’t wait to see what happens next for Jaron. Nielsen did not disappoint. Jaron has just taken the throne, but his regents only know him as the reckless child always causing problems. They aren’t sure if he can lead a country. After an assassination attempt, the regents are even more convinced that the best way to keep the country safe is to appoint a steward until Jaron can lead. Jaron has a different idea about how he can save his country, one that takes him right into danger. I’m not sure word I’d use to describe Jaron. He’s clever and smart, but not always in the perfect moment. He’s sarcastic and likes to act as though nothing gets to him. In reality, he uses his humor to keep people at a safe distance. He’s still hurt by what his family did to him, and if his only family could do that, what reason does he have to trust everyone else? He is a fascinating character and I’m so glad we have another book to spend with him. The secondary characters are just as fantastic in this novel. They play major roles, even if they aren’t the main character. Jaron needs them; he wouldn’t be able to find success without them. Jaron might take the lead, but he’s nothing without his help. The plot of this novel was perfect. It didn’t feel like one of those, “I have to sacrifice myself for the greater good” plots. Jaron is throwing himself to the wolves, but he’s doing it with the intention of fighting until he can’t fight anymore. And even at that point, the lowest of low, he will find a way to keep going, There’s eve a little romance thrown in there for good measure. 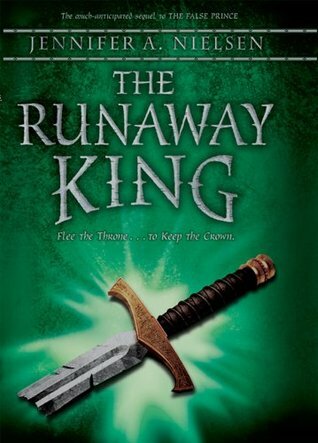 The Runaway King is a superb sequel that does not disappoint. It’s just as wonderful as the first. The action is there and now the stakes are even bigger. It was only Jaron’s life on the line in the first book, now the lives of those he cares about and his country are at risk. He knows what happens if he fails. Nielsen has another amazing novel and I can’t wait to see what she does in the last installment. This entry was posted in Something a Little Different, The Must Reads, Young (and New) Adult and tagged Fantasy, Jennifer A. Nielsen, Must-Reads, Young Adult.